LOWELL, Mass. – A UMass Lowell expert on mercury is studying how much of the toxic substance accumulates in forests with an eye toward reducing the dangerous pollutant worldwide. 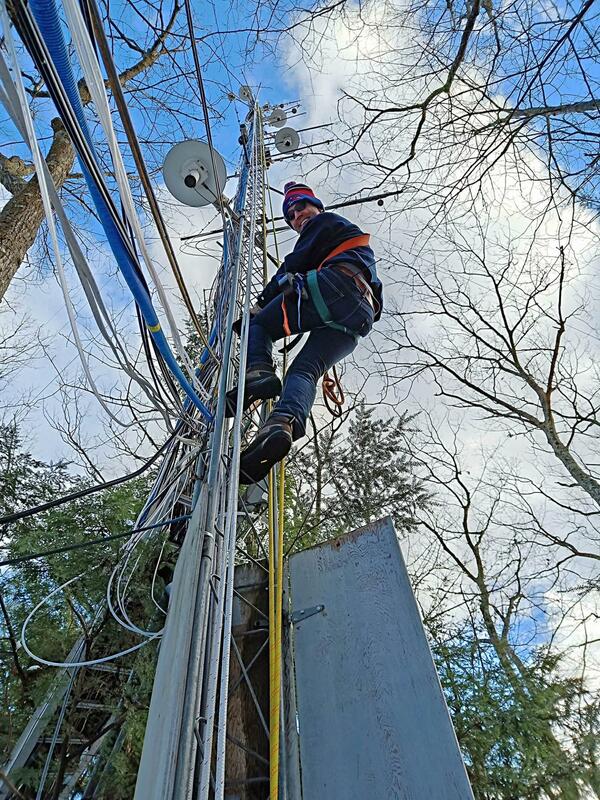 UMass Lowell’s Daniel Obrist is leading a research team with Roisin Commane, an assistant professor at Columbia University, that is measuring how much mercury gas from the atmosphere ends up in forest soils and how it contributes to mercury pollution in watersheds. Members of Obrist’s team include UMass Lowell environmental science majors Sean Haggett and Eric Roy, along with Ph.D. candidate Ting Wang, all of Lowell, and Shiwei Sun, a visiting Ph.D. student from China. The analysis, which is examining forests in Massachusetts and Costa Rica, builds on Obrist’s pioneering work that identified a critical role of plants in scavenging mercury from the atmosphere. “The knowledge gained from this new project will be used to assess how mercury gets deposited right into our watersheds in New England, as well as in other forests across the world,” said Obrist, chairman of UMass Lowell’s Department of Environmental, Earth and Atmospheric Sciences and a Newbury resident. “Human exposure to mercury is primarily driven by eating fish,” Obrist said, noting that in many cases, the source of this mercury stems from runoff processes from forests. Obrist has identified and tracked the causes of mercury pollution all over the world, including in the Arctic and the Dead Sea in Israel. Hundreds of tons of mercury emissions produced each year by burning coal, mining and other industrial activities are lofted to the atmosphere. Subsequently, mercury gas is absorbed by plants in a process similar to how they take up carbon dioxide. When the plants shed leaves or die, the mercury gets into the forests and soils, where large amounts also make their way into watersheds. Obrist and his colleagues call this cycle of mercury “vegetation pump.” In this latest study, the researchers are measuring the prevalence of mercury that has settled in the two forests through the same process. “Scientists now understand this vegetation pump dominates as the source of mercury on land, accounting for 54 percent to 94 percent of mercury deposits in soils. But no direct measurements of this process to date are available from forests, which constitute the most abundant ecosystems globally,” he said. The dense forests being studied were chosen in part because they are located in known mercury hotspots: the northeastern United States and the tropics, according to Obrist. Each forest – one in western Massachusetts and another near San Isidro de Penas Blancas in central Costa Rica – offers two contrasting ecosystems for study. The forest in Massachusetts features broadleaf trees that shed their leaves every year while the Costa Rican site is an evergreen rainforest where many trees and plants retain their leaves throughout the year. Obrist’s team is using a variety of instruments and sensors to measure the forests’ uptake of mercury in the atmosphere at various heights from above the tree canopy down to near the forest floor, allowing for daily tracking of how mercury levels may be different in each forest and may change with the seasons.